Just Julie B's Stampin' Space: My Big Debut and a Giveaway! If you’re looking for a cute way to give some Halloween treats, this Lidded Pumpkin Box and its’ coordinating card might be it! With the ribbon ‘stem,’ you can either hang the box for a fun décor piece or use it as an easy pull-up handle to hide some special treats. This is it... my Craft Project Central debut! This is the project I made as a Guest Designer for the month of September. You can get the detailed instructions along with pictures for my project, plus nine other projects for only $10 when you subscribe to Craft Project Central for the month of September 2011. 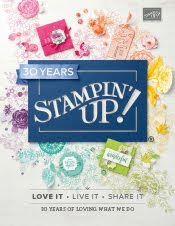 Not only are all the projects super cool, but all the projects are all Stampin' Up! So how would you like to get a FREE subscription to Craft Project Central this month? You'll receive the tutorials to all ten projects, plus a bonus project this month. All you need to do is leave a comment on this post - and you'll be entered in a random drawing. I'll choose a winner on Friday, September 9th at noon Pacific time. Love the pumpkin box and your card! Thanks for the chasnce to win! Cute, cute pumpkin box!! Great Debut for you! This is so cute and original. I love 3-D items and this one sure hits the spot! Julie - You are so talented. I just love the box and card. I've been looking for some cute ideas to use at my Grandson's elementary school. Gorgeous Project Julie. I am going to try this box very soon. Glad to be part of Craft Project Central. Now I'm in the mood for Fall projects! Thanks for the inspiration, and congratulations on your debut as Guest Designer. I'm so lovin' the pumpkin box and card. What an awesome idea. Thank you for the inspiration. Thanks for a chance to win. Great little box and the card is adorable. I'm always looking for new ideas for boxes. What wonderful projects! Good luck! Super cute! Congrats on your debut! Thanks for the chance to win. I just love your projects....and the pumpkin box is the greatest idea. I am really diggin' the pumpkin treat and would love to get one ;0) The Greeting Card Kids card is too fabulous. I am glad to be entered to win at Craft Central! What a cute pumpkin box and card! Perfect for the Thanksgiving day buffet, well the pumpkin box anyway! This can be used for all kinds of holidays! I LOVE IT. I love your projects, your watercoloring is so good! I just found your blog from Paper Punch Addiction. Very cute! Thank you for your inspiration!